It’s my turn this week to update the Sainte Bastien blog and this is just one more reminder why it’s so great to be part of such a fantastic team. I didn’t even know what a blog was last year and no one would have asked me for one. You strive all your life for success and us jockeys are more competitive than most, so to finally make it is a dream come true. I felt bad for Mark having to retire so unexpectedly, but I never dreamed I’d be offered the job and I’m definitely going to make all those doubters eat their words. Riding as a freelance, I was in different yards and never really part of a team. I did have one main stable, but it was so much smaller, just 30 horses and 10 staff. Coming here, there are 50 of us minding 150 horses and it’s great to get feedback from the team of staff. It helps to know about the individual horses before you ride them in a race, they’re all different with different personalities, and the lads and Mark have been a huge help. I’d only ridden two winners at the highest level up ’til now, but I’m sitting on Classic stars every morning here at Sainte Bastien and looking forward to my first Classic win. Maple Leaf is my favourite horse and the best I’ve ever sat on. He was Mark’s cast-off last year, when I got to ride him, but we surprised everyone and won, beating Mark on the stable’s number one. I never thought then Maple’ would become my permanent ride. To have such great horses and to be part of such a great team, it’s a dream come true and I’m determined not to mess up. It’s a bit nerve-wracking, but everyone’s so supportive and helpful. The Guv’nor, Mr Marchant, doesn’t suffer fools gladly, but I’m riding at my best. A good horse makes a good jockey. They have the power and ability to get you out of holes and they give you confidence. Maple’, he’s given me that shot at greatness. There are jockeys who’d give their eyeteeth to get a horse like him. We’ve a great season ahead of us, me, Maple’ and the whole team here at Sainte Bastien. So keep tuning in to the blogs! Want to read more about Kym, Mark and the rest of the crew? 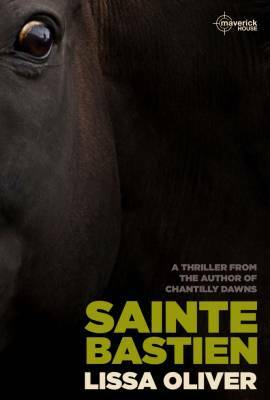 Make sure to check out Lissa Oliver’s latest book in The Skullcap Trilogy, Sainte Bastien. 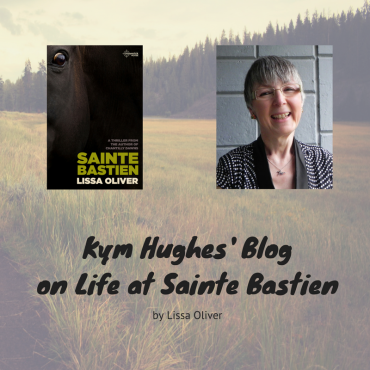 Be sure to keep up with the Sainte Bastien riders on the blog too; Lissa’s journalistic prowess is being put to good use as she uncovers more of their story from before the events of her new book. Who was The Last Executioner?